ePublishing Knowledge BaseePublishing Knowledge BaseePublishing Knowledge Base Creating and Managing Directories & Buyers GuidesHow do I create custom directory listing details that will appear on my directory listing? Publishers that want to show data on directory listings unique to your publication must first set up custom directory listing details. 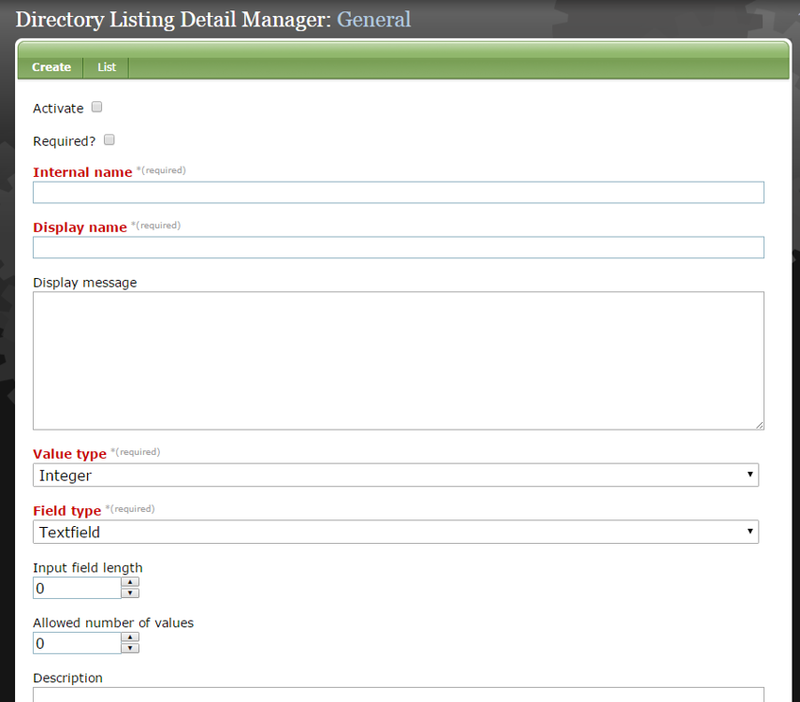 The Directory Listing Detail Manager controls the creation of the fields that display on your more complex directory listings. If you have questions about this, please contact your Solutions Manager. Note: Depending on your site's customizations, changes here may not be shown on the site. Please ask your Solutions Manager if you have questions. Important: You will need access to the Sys Admin > Directory Listing Detail Manager. Talk to your systems administrator to get this privilege added to your role or as an individual privilege in the User Manager. To learn how to set up an event that uses these custom directory listing details in your Event Manager, read this article: How do I create a Directory Listing? 1. Open the Directory Listing Detail Manager. Find it under Sys Admin on your dashboard. If you need access to the Directory Listing Details Manager, please talk to your systems administrator. 2. 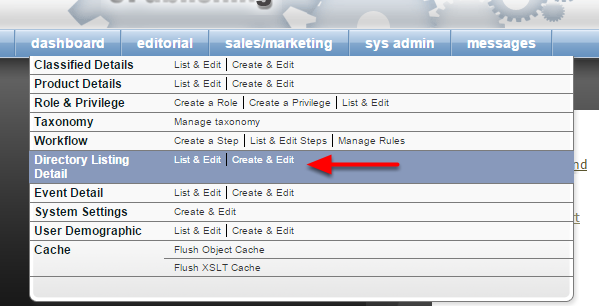 To create a new custom directory listing detail, select Create & Edit. The Directory Listing Detail Manager will open. Zoom: To create a new custom directory listing detail, select Create &amp; Edit. The Directory Listing Detail Manager will open. To determine the order of the details on your directory listings, your site administrator can update the order in the Sys Admin Directory Listing Detail Manager by dragging and dropping the fields. 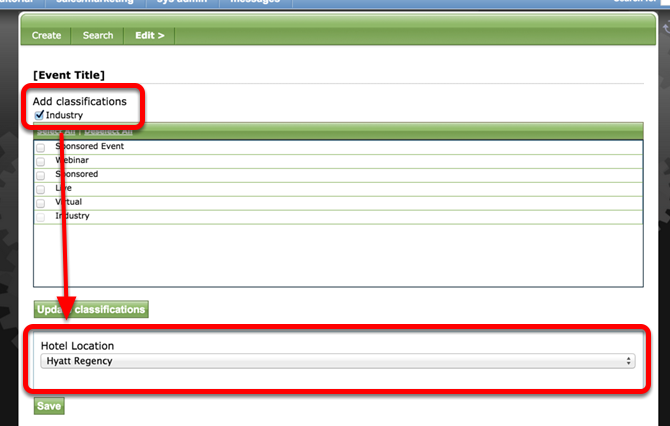 NOTE: Contact ePublishing to reset the system to use the updated order of the custom directory listing fields. This is best handled as a Help Desk ticket. The order will affect the landing pages of all events tagged with that directory listing classification. 3. If "Activate" is unchecked, it will be visible when editing the Custom portion of your Directory Listing in the Directory Listing Manager. 4. If "Required?" is checked, anyone setting up a directory listing MUST enter content to this section or they will not be able to save any changes from the Custom subform. 5. Internal Name is required. This should be a short descriptive name in lowercase about this section of the directory listing. For example: branches or custom.data.2013. IMPORTANT: This must be lowercase, include no special characters, and include a period for spaces. 6. Display name is the title of the section. It is required. Where this label appears depends on the layout of your site's directory listing pages. 7. The Display message will not appear on the directory listing page. Zoom: The Display message will not appear on the directory listing page. 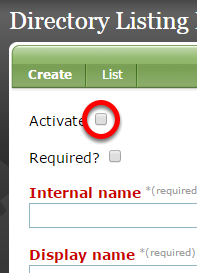 It is there to give you a space to add instructions to your team on what it should add in this section when setting up the directory listing. This is not required. This will only appear in the Directory Listing Manager under Custom. 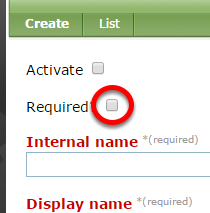 Checkbox = This uses checkboxes, allowing the selection of a set number of options. Radio button = This uses radio buttons, allowing the selection of a single option. 10. Assign a Classification or Classifications for the Directory Categories type that will use this custom field. For example, the custom detail "Branches" would only apply to a listing with branches vs. a listing with annual report data, so you only want it to appear for directory types that are relevant. In this case, we've selected "Buyer's Guide." 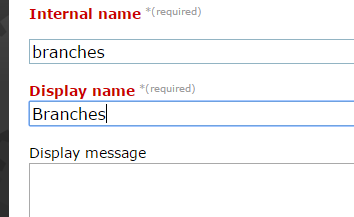 Type in the name, and click Add more on the right if you have additional choices. Select the box under Default if you would like it to default to one of the selections when setting up a directory listing. 12.3. This is how the Option Labels and Option Values show when setting up the custom directory listing details under Directory Listing Manager > Custom. 14. To create a new Directory Listing or modify an existing one, return to the Directory Listing Manager. You will find the details you just created under Edit > Custom + the relevant Directory classification. Learn more about setting up directory listings here: How do I create a new directory listing? Prev: How do I display different tabs on my directory listings for different types of content? Next: How do I allow existing paid directory listings to upgrade or renew?